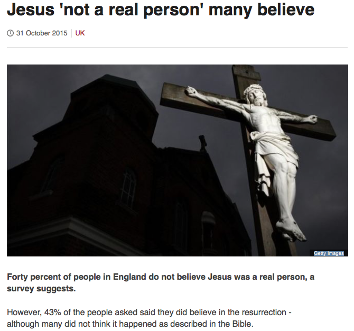 Forty percent of people in England do not believe Jesus was a real person, a survey suggests. However, 43% of the people asked said they did believe in the resurrection - although many did not think it happened as described in the Bible. The figures also found while 57% classified themselves as Christian, fewer than 10% actually go to church. The survey of over 4,000 people for the Church of England will be discussed at its next General Synod in November. Many scholars agree that Jesus was a real man, who lived in Galilee over two thousand years ago, although many details surrounding his life are still debated. 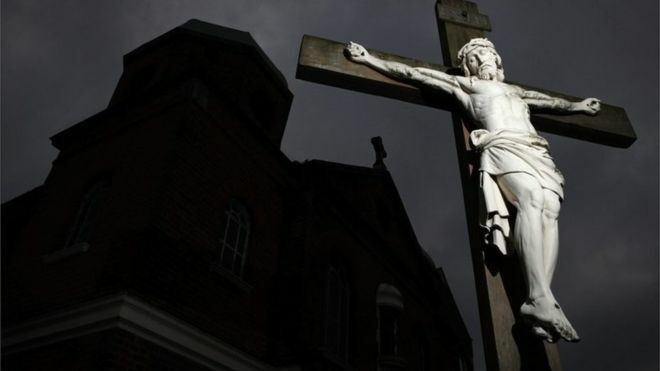 But, the Church of England survey found that four in 10 people did not realise Jesus was a real person, with a quarter of 18 to 34 year olds believing he was a mythical or fictional character. The poll was part of a wider research project looking at both practising Christians and the wider population. After Christians, the second biggest group identified in the poll - 12% - were atheists, while 9% were agnostics, Muslims represented 3%, with Hindus and Jews both making up 2%. English Christians are more likely than the average English adult to work in education, or professional jobs, but less likely to work in finance or insurance, the survey concluded. Article published on the BBC website 31st October 2015. Click on picture to the right to be taken to the Original article on the BBC website.